RPGamer was recently given the chance to put a series of questions to Snowcastle Games, developer of the Earthlock series as it looks ahead to the second title in the series, following a recent enhanced re-release of the first game. 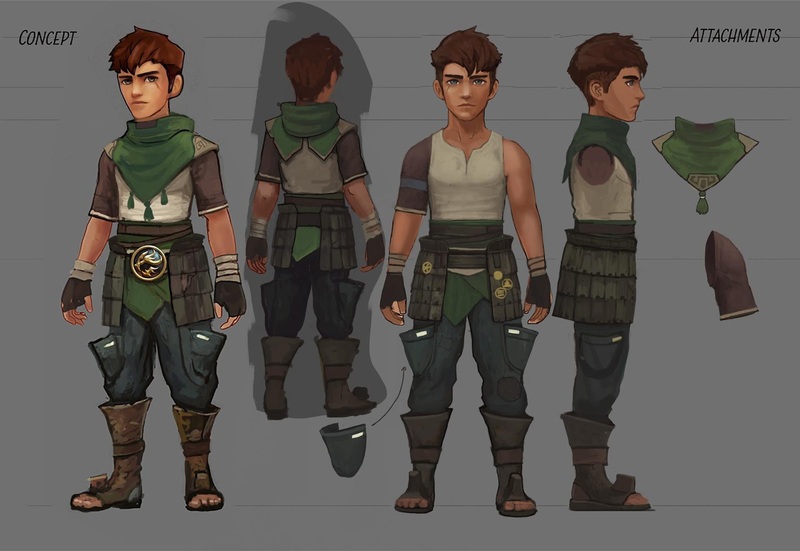 The developers covered a wide area, from Earthlock’s beginnings and development, to some of the challenges and benefits from crowdfunding its development, as well as the creation of its enhanced re-release, and a few hints of how its sequel is progressing. Alex Fuller (RPGamer): Can you give us a brief overview of how Earthlock and the ideas behind it came into being? Nikola Kuresevic (Junior Game Designer, Snowcastle Games): Our team consists of a lot of different people with different backgrounds. The one truly connecting factor is our love for RPGs, especially the ones we all played growing up. Keeping in mind the modernisation of the genre we were eager to make something that would finally scratch the nostalgic itch we all seemed to have. Going about making such a game however was a daunting task. It all started, as all great stories do, with two people meeting. Although this isn’t a love story, more of a literal interpretation of two people discussing a longing for the 3D RPGs of the late 90’s. I’m of course talking about our CEO and Earthlock’s Art Director. Their discussion soon led to a small team of four people contributing to an elevator pitch that propelled the company into what it is today. With new hires joining the team over the years, each and everyone has added their own flare and background, their love for the genre and games outside of it to Earthlock. So actually pinpointing any one mechanic or system to a time, place or person is difficult, if not impossible. One thing is very clear though, and that is that Earthlock is an amalgamation of the entire team’s collective experiences playing RPGs growing up. AF: What made the team decide to emulate a JRPG style of game in particular? NK: This goes back to the previous question, the fact that everyone at the office shares a love of playing RPGs. The team consists of a good mix of industry veterans as well as young hires fresh in the industry, but the connecting factor across the large gap of experience will always be the fact that we connect over the love for the same games. Snowcastle has grown over the years, and though most of the reasoning for choice of genre and core mechanics were decided and developed when the company was still in its infancy, the desire to make something that really stood out, and also spoke volumes of who we are as a company, still holds true. We just want to make games that we’d enjoy playing ourselves. What better way to tackle that than with a genre we all connected with even before we ever thought we’d be making games to begin with. AF: How has being a western developer trying to create a JRPG-style game caused any particular difficulties, and if so what did you do to help overcome those? Were there any challenges in the attitude of potential players? NK: Well, there’s no hiding the fact that the JRPG genre is loved by many, us included. Within that group of people a certain amount will always be reluctant to change, we were even part of that group, which is why we wanted a game that took us back to the “good ol’ days”. That being said, we realised that a mix of tropes and quality of life improvements introduced to the genre over the years was a fine line to balance. Things we found to be paramount to the genre weren’t necessarily agreed upon by others. Such is the nature of subjective experiences and the fallacy of nostalgic recounts from childhood days of sugar fueled gaming sessions. Add all of this to the fact that not only haven’t we attempted to make such a game before, but we didn’t really know others we could ask that did either. So we set out on this wonderful journey to see where it would lead us. Much like the plot of Earthlock, we encountered a ragtag band of followers when we eventually got funded through Kickstarter, which helped us gauge what it was they wanted to see come out of this whole adventure. The JRPG genre and style brings back a lot of different memories for a lot of different people. Personally I remember the epic story lines and insane battles, other might reminisce of the weird puzzles and genius outcomes of them. Some might not even have cared about all that because for them the soundtracks are what mattered. Which meant that we had a lot of different aspects of the genre to handle with EXTREME care before going forward. This is really where our ragtag band of Kickstarter backers shone the brightest, and still continue to do! As more bits and pieces of the puzzle came together, we had things to show them. Things they liked, others that needed work. As we shared something that was held to their standards, they would take it upon themselves to present “our shiny little thing” to the world. They were as excited about it as we were. This exchange also continued even after the fact that Earthlock: Festival of Magic was released, which prompted us to go back to the drawing board and further develop our concept. The difficulties of being a Norwegian company attempting a JRPG boils down to game feel, at least for us. Does it feel right? Does it feel like the JRPGS we grew up playing when we were younger? Queue the opening statement to this answer – we’re confident that we’ve managed to keep a balance between the old and the new. Especially with the reworked Extended Edition that further solidifies the fact that we want to hold true to the genre. As far as attitudes of gamers go, they’re part of our community. They might not know it, but every source of feedback we’ve gotten since the original launch, be it good or bad, has shaped Earthlock into what it is. So we wouldn’t call it challenges in tackling attitude, we’d call it honest feedback. AF: How did you go about developing the graphical style of the game, how did it change from the initial concepts? Fredrik Dahl Tyskerud (Lead Artist, Snowcastle Games): We always wanted to create something vibrant and colourful, so that was always a base mantra for us. We were also clear on wanting to make something stylised from the outset, both for aesthetic and practical reasons. On the aesthetic side I think that something stylised has a larger potential to hold up better over time compared to something that leans on current tech that can make things look dated fairly quick. The practical aspect of it was also that we are a small team, and with only three artists at the outset of the project looking to create a whole world, as well as characters and creatures to inhabit it, we had to choose a way of doing it that made it at all possible for us. We’ve used a lot of different reference points, from Disney to the turn based RPGs of yesteryear to inspire the direction of the game. While some of the inspiration points are clear, we still wanted to create something that was ours in terms of visual style, so we ended up iterating quite a bit in the early days before settling on what we see in the game today. We tried from the outset to create bold, fairly simple designs for our characters and creatures to where they’d be recognisable. 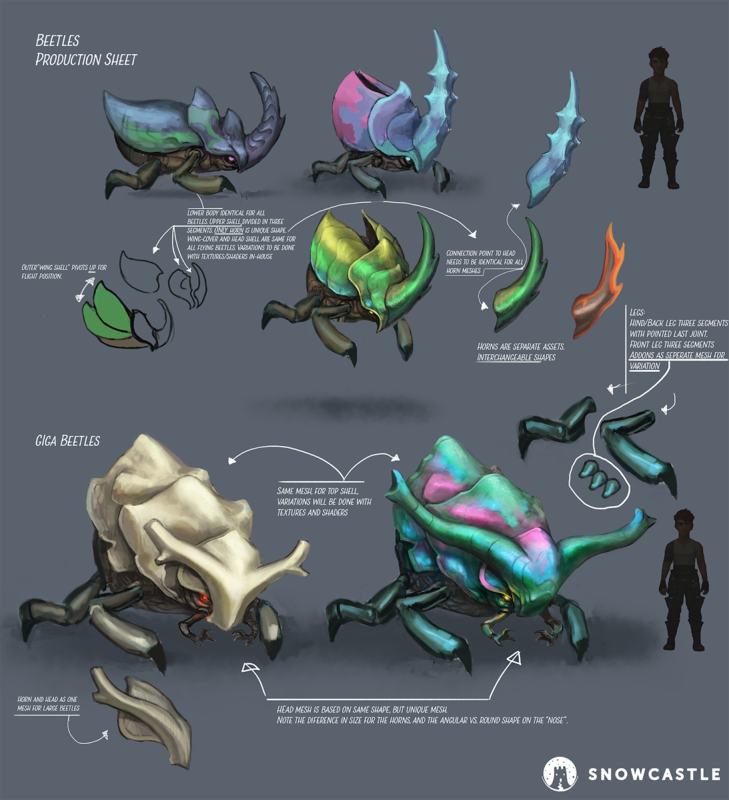 We did evolve a fair bit from the initial designs into what made it into the game however. The first concept art phase was a lot more simple than what we ended up with. This evolved both out of our desire for a more interesting visual style, as well as the gameplay needing more features. 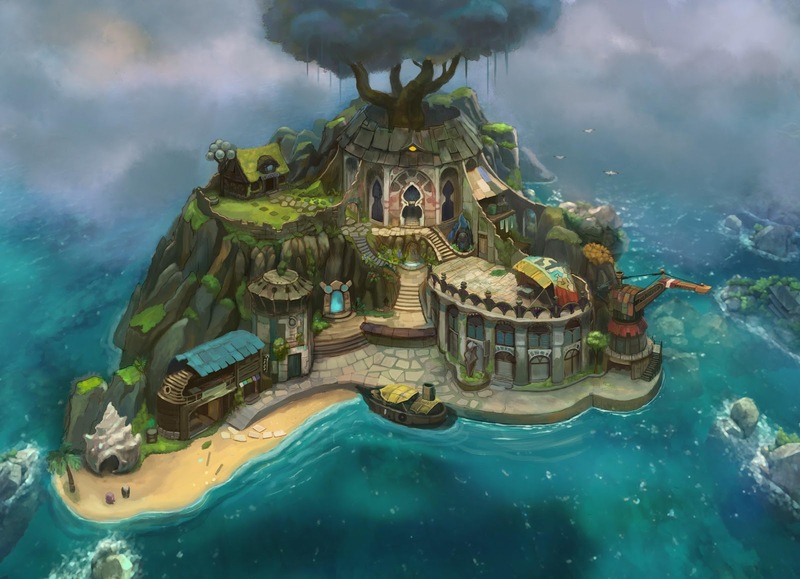 For example the home base of our game, Plumpet Island, went from a very simple couple of buildings sitting on a beach, where the player would move like they would in a sidescroller almost to a fairly elaborate structure sitting on an island that has different levels to it. Our first thought on the character design of the game was similar to that of golden age Disney where the characters are more simply drawn than the elaborately painted backdrops. In those days, that was a practical consideration as well of course, hand animating something painted would be too resource intensive, but it also ended up being a very nice style where the things that move are contrasted to the background. The action for the viewer is clear. This is very important with games as well, where the players need to be able to work out what they are doing in the world at any point. We have still retained some of that initial idea, but our characters have also moved from something simple with a cartoony look towards something a little more detailed. The first and final iteration of Amon shows the visual journey one of our main characters went through from start through the final concept art to the finished 3D model. Note that we still employ colour contrasts with the saturated warms of the skin set next to the more muted clothing. For the next game we’re going to try and evolve the visual language we had for the first game to elevate it while still remaining very much in a colourful stylised space. AF: Earthlock recently received a re-release with an assortment of new additions and upgrades, can you detail some of the improvements that you’ve made over the original version and how they have helped improve the experience? Nikola Kuresevic: First thing to mention here is that a lot of the improvements that have gone into re-release are based off of player feedback in addition to changes we wanted to make ourselves but were otherwise unable to. The knowledge we’ve accumulated over the years of developing Earthlock also allowed us to realistically plan and schedule improvements going into the projects without fear of having to cut back or otherwise downscale our vision for the Extended Edition. One of the bigger complaints about Festival of Magic was the story’s incoherent and flat structure. I need to mention that this is not our writer’s fault, but rather an unfortunate outcome of having to make cuts to the original project. The first thing we then had a look at was ways of patching the story in order for the characters to shine through where they otherwise would have blossomed in the parts of the story that were cut out. Following changes further grew out of that, adding new environments, animations, side quests, developing the main storyline, cutting down on tedious parts and further developing the fun parts. Not to mention the copious amounts of optimization! As a small studio we’re often forced to wear multiple hats, going back and forth between tasks that don’t necessarily touch on the actual game or gameplay aspects. But having grown individually as well as a company allowed us to tackle more of the project head on and work as parts of a bigger machine. (This part is probably more exciting for us internally, but looking back it really made the entire Extended Edition possible where it probably would’ve takes us ages more, if not at all possible, just a couple of years back). All of these changes as part of a larger picture has helped ground Earthlock as a JRPG into a more solid experience, where as much as we wanted it to be before, wasn’t really the case. AF: At what point did you decide to go ahead with the re-release of Earthlock and what were some of the motivating factors behind it? NK: Once the original release of Earthlock: Festival of Magic was done we started looking at player feedback and reviews, collecting any and all information on the game that was made available. A lot of the feedback rang true to what we thought of the game. It’s not that we thought the game was bad, in fact we were immensely proud of having achieved such a feat. We had set out to make an epic RPG, and we firmly believe that we did that. But as with all games, cuts needed to be made during the development process. Some due to scope, others to budget and so on. It turns out that the cuts that were made were visible in the final product. Something we thought was a lingering feeling of “what could’ve been” had we not cut so-and-so part out of the game actually became part of it. And the players felt that. At this point we were already weeks into the development process of our next game. Making the decision to then go back on a project we had, for the lack of a better term, left behind, was not an easy decision. One of the amazing aspects of indie game dev, especially in such a small industry as in Norway, is the need to wear a lot of different hats (no, I’m not talking about the literal kind), which means that not a day goes by that you’re not learning something. Heading into a new project means that you get to utilize EVERYTHING you’ve learned from the past project, applying that as well as developing that further, learning, molding and contributing not just to the project, but to yourself. Then being told that we needed to go back and rework aspects of the previous project is undeniably a tough pill to swallow. Ultimately it made sense that we needed to go back and cut that “lingering feeling” out. We had after all set out to create a game we wanted to play ourselves. Having distanced ourselves from it and reading the feedback was just the push we needed to realize that steps had to be taken in order to get the game back on track with our vision. 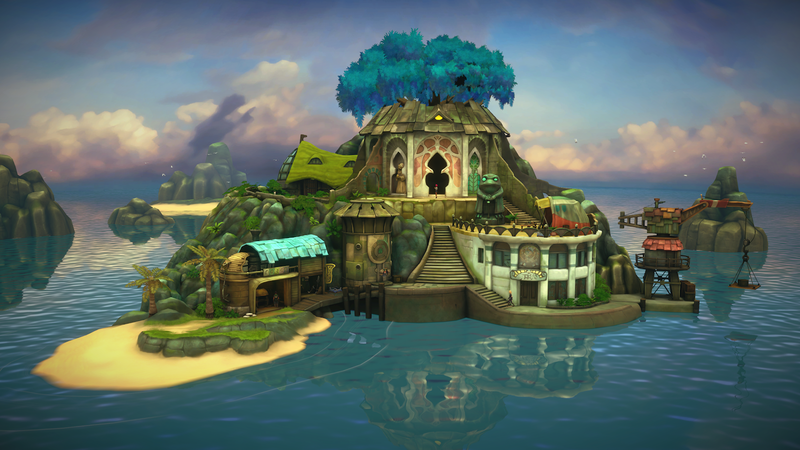 We want Earthlock to not just be “another” game, we want to create a strong IP that we can explore with our players. As such, putting the hard work in to make a steady foundation wasn’t just the right thing to do, but necessary for the company to get back to its core vision. It took another thirteen months to accomplish this, but we’re happy we did! AF: How has the feedback from players been for the new version? NK: We’re lucky enough to have an amazingly dedicated group of fans around the globe. And the feedback that’s come back has been overwhelmingly positive. We’re also in a somewhat unique position to have fans replay our game comparing it to the previous release, praising us not only for the fact that we’ve added more content to the game, but also for genuinely caring about our product and most importantly, for caring about the consumers. In a larger scale it’s also affected our score in ratings all over with a 20% increase across the board for Earthlock compared to our previous release! There are however some more elusive things we’re still trying to figure out. One of them being foreign markets such as China. Working on an upcoming language patch, we’ve recently published ten new languages on Steam with a full re-translation of our original Chinese due to player feedback. Comparing the feedback from other places around the world, we’re seeing that the Chinese market differs. Coupled with the fact that we unfortunately don’t understand the feedback coming in makes it hard to pinpoint the exact issue of the complaint. At the time of writing, our reviews on Steam are at a 90% positive user feedback score, but the elusive complaints from the Chinese market don’t factor in to that. The differences in the reception of the game don’t add up. AF: How has your experience with crowdfunding on Earthlock? What were some of the benefits or pitfalls? Bendik Stang (CEO, Snowcastle Games): It was a nerve wracking experience as the survival of the company rested on the success of the Kickstarter campaign. Fortunately we succeeded. The one thing we had not expected was the amount of work that is required to keep the community informed of progress. We have so far made seventy-one Kickstarter updates. Each update takes three-to-six hours to write, proofread, design and publish, which makes it over thirty-five days of work in just the updates. It is worth it though. We have one of the best and most positive Kickstarter communities I know of and I attribute that to having informed them honestly about what we were doing and why. AF: Is there anything you would have differently in hindsight in the development overall? BS: The knee jerk answer is yes! There is so much we could have done differently in hindsight. It was an extremely ambitious game we set out to make with a small team and little funding. The fact that we pulled it off is amazing to me. But going back in time I don’t think we would have done things all that different. We knew we set out to make something that was extremely difficult and through this process we have learned so much more than if we picked a safer path. So, instead of looking back I prefer to look forward and focus on how much smarter, faster and better we can make our next game now that we have all this wonderful experience that we did not have before. AF: What are some of the most useful lessons you’ve learned from the development of the first game that will help with future development? BS: Where to start? First and foremost, we have a better ability to plan things. We have a different production flow, with e.g. buddy checks to avoid manual errors. We have set up a better communication flow to ensure we can tap into the creativity of everyone on the team. The sum of this is that we reduce the chance of having to redesign things down the line. We have also a better understanding of what parts of the game will require a lot of iterations and testing before it is matured into great gameplay. One thing that will be very different going forward is that we now have a large nice community from Earthlock 1 that we hope to engage in the development process for Earthlock 2. This way we can ensure that we focus our efforts on gameplay that is fun. 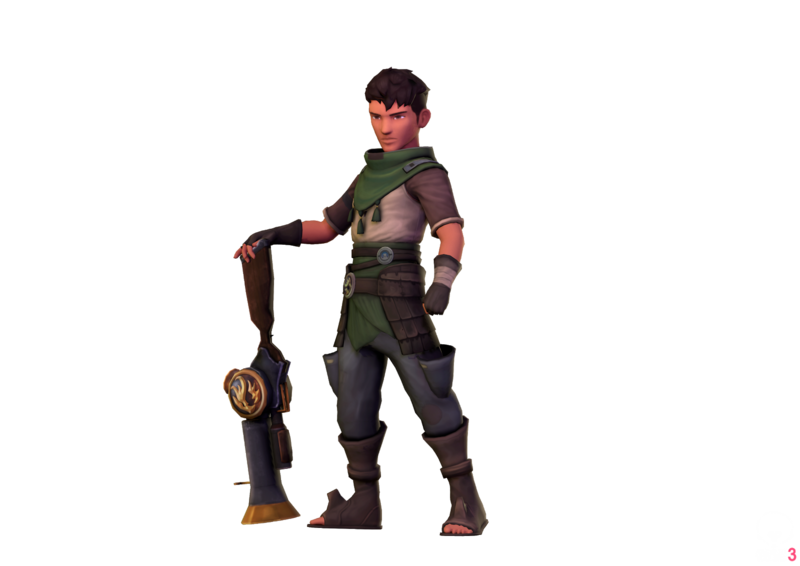 AF: Speaking of future development, how are things progressing on Earthlock 2? BS: We have been in pre-production for a while now. Planning and exploring where we want to go with it. For Earthlock 1 we made a homage to our fond memories of games we loved when we were younger. 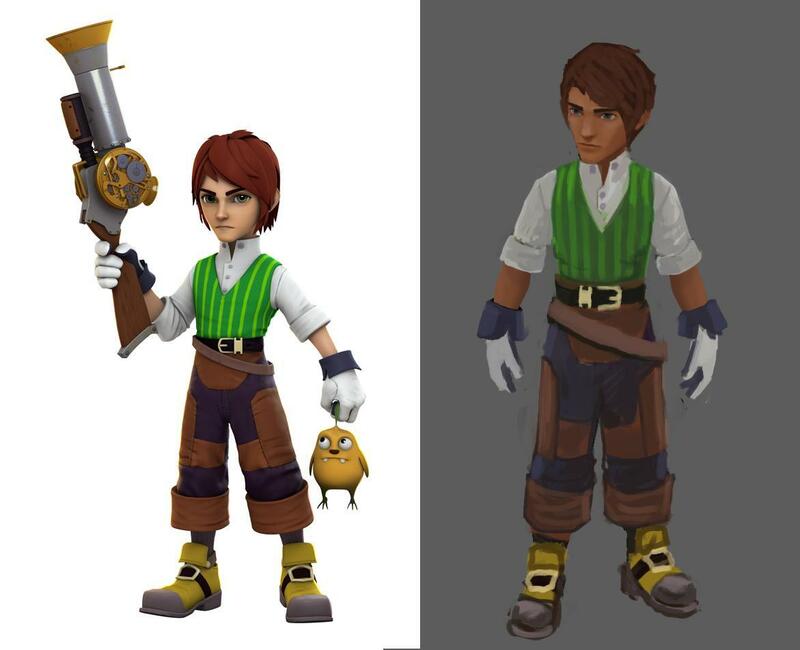 For Earthlock 2 we will be making something new and modern. AF: What are some key changes or improvements you are looking to make for Earthlock 2? BS: I can’t say much yet, but we are looking at some form of multiplayer, and for the narrative we will be looking more into the personal stories rather than the epic world saving events. RPGamer would like to thank the developers at Snowcastle Games for answering our questions as well as to Plan of Attack for facilitating the interview. Earthlock is currently available for PC, Mac, PlayStation 4, Xbox One, and Nintendo Switch.